With a simple yet stylishly powerful interface, this photographic camera app includes a large variety of live photo filters in lightning-fast real-time, such as several Lomo and Lo-Fi effects, artistic painting, cartoon and paper styles, vintage, retro, analog, several deformations types, including even fish-eye, wide angle camera filters, and many more. 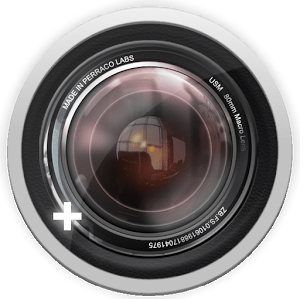 In total over 180 customizable camera photo effects, and over 20 frames. Also you can create little planets with the Stereographic filters adjusting the intensity level, or just use the preset ones. All filters are customizable. With the easiest Panorama mode you can find. The Panorama mode manual nature gives you full control over the final result. Try using different filters, people or objects in each shot to create unique panoramic images. Your imagination is the only limit. Record easily GIF animations with all the available effects..You can also change the GIF recording speed to produce funny GIF animations. * Requires Jelly Bean 4.3 or higher. * All filters are supported. * Fast motion recording. (Tip: Try it with a selfie, using a MORFO filter). * Recording with or without audio. * High quality (has to be activated in the configuration settings).